The DT series large multi-membrane cable entry grommets are suitable for feed-through of several standard cables with varying diameters. It can be used anywhere where a large number of electric, pneumatic or hydraulic lines must be routed and sealed with IP54. Due to the high cable density, the DT grommets are perfectly suitable for the assembly of subsequently terminated cable harnesses. Therefore, the grommets are an ideal extension in combination with various cable entry frames. 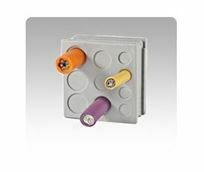 DT grommets are compatible with numerous cable entry frames such as KEL, KEL-U, KEL-ER, KEL-FG and KEL with extensions.Due to the identical shape of the grommet sides, the membrane cable grommet allows an inserting from all sides.